Standing rigging + running rigging 2017, RAYMARINE autopilot 2017 , new batteries + charger 2017, new steering bearings, new fridge compressor, new gas system , boat is in very good condition! Electronic tools for navigation: Rudder angle indicator, Autopilot (new!). Staging and technical: Engine Alarm, Water pressure pump, Battery charger (new! ), Deck Shower, Gangway, Platform, Automatic Bilge Pump, Manual Bilge Pump, Teak Cockpit, Shorepower connector, Electric Windlass, swimming ladder, Outboard Engine Support Bracket, cockpit table, Tender, Windex. Domestic Facilities onboard: Warm Water System, 12V Outlets, 220V Outlets, Manual Toilet. Security equipment: Barometer, First aid kit, PFDs. Entertainment: Speakers, Hi-Fi. 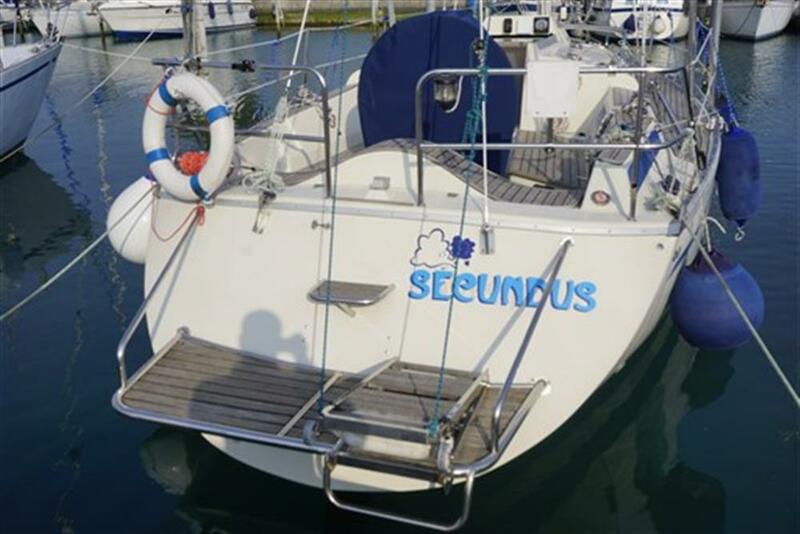 Sails accessories: Spi Equipment, Jib Furling System, Lazy Bag, Lazy Jack, Rod Kicker. Kitchen and appliances: Galley, Burner, Refrigerator (new compressor). Upholstery: Instrument Cover.